No aftermarket engine components are needed to surpass the horsepower output of the Mercedes-AMG E63 S.
There’s a famous quote by poet Paul Valery that says, “a poem is never finished, only abandoned.” Essentially, Valery is saying that a poem, like any work of art, can be continually altered and refined and is only “completed” when the author intends it to be. The same goes for cars, because even a vehicle that leaves the factory as a masterpiece can be improved upon, just ask John Hennessey. And that’s exactly what Italian tuner Pogea Racing decided to do with the already stellar Alfa Romeo Giulia Quadrifoglio. Pogea Racing specializes in tuning Alfa Romeo, Fiat Abarth, and Audi models by giving them upgrades capable of silencing any haters with grilles full of dust. Given that all three automakers are currently spewing fairly interesting products, there is no shortage of potential. We tested the 505 horsepower Alfa Romeo Giulia Quadrifoglio and found it to be a car that couldn’t possibly be any better for extracting the fun out of high-performance driving, but Pogea felt differently, believing that it could make the Giulia even better by giving it a makeover. Keeping the stock engine parts, the Italian tuner coaxed an extra 99 horsepower out of the 2.9-liter twin-turbo V6 engine for a grand total of 604 hp. That puts it on par with the Mercedes-AMG E63 S. The main concern at this point is reliability. 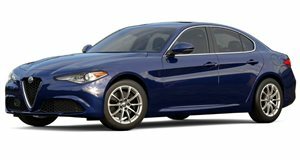 The Giulia Quadrifoglio already makes an impressive 174 horses per liter when stock, but the tune forces the engine to deal with 208 hp per liter, a level of output that strains components. Still, Pogea Racing doesn’t want to stop there with its Instagram account, where it initially posted this boosted Alfa, claiming that we could soon expect 700 PS (690 hp) out of the Giulia before it abandoned this piece of automotive poetry. That will likely take a reworking of the engine’s interior components in order to stand the 237 hp per liter that it would produce, but either way we’d love to get behind the wheel for a spin.